A trick-taking card game is one in which players take turns playing cards and the highest card played in each round wins what is known as the trick. Typically, the goal is to win more tricks than other players or teams. 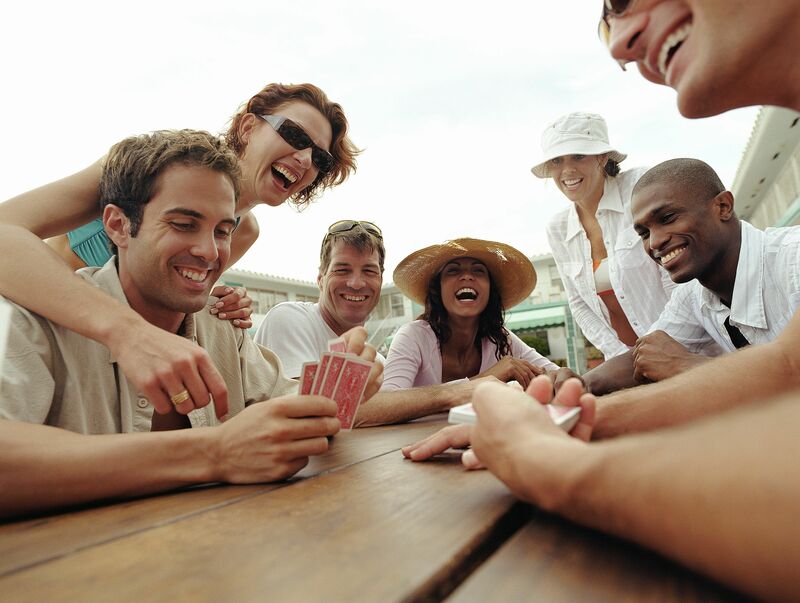 There are many different games within the genre, including favorites like euchre, spades, and hearts. Trick-taking card games are among the most popular and enduring. They're fun for a group of friends and great for families. Most are also easy to play, once you know the rules. Everyone tends to catch on after the first few hands. If you're up for some friendly competition, you'll certainly enjoy these classic card games. Euchre is the ultimate trick-taking game with many dedicated fans. Four players are required and they're paired up in two teams. It's a relatively simple game and you'll play with only a partial deck. Many people go with the 24-card deck, while others use 32 or, in British euchre, 25. There are a number of variations on euchre. They vary slightly in the rules and the number of players. For instance, three-handed euchre is a version for three people. The goal in most, though, is to be the first partnership (or individual) to reach a certain number of points, which are gained by grabbing tricks. Spades is a very popular game and it can offer hours of fun. This one typically uses four players in two partnerships, though it can be played with just two players. You'll need a full 52-card deck for spades and a willingness to wager against your opponent. During each hand, every player estimates how many tricks they think they can take based on the cards they've been dealt. You don't want to overbid or underbid and spades are wildcards in the deck. The first partners to reach 500 points win the game. Call it oh hell, oh pshaw, or blackout, by any name, this is a great card game. If you love to strategize, it is an excellent one to learn. It doesn't require partners, so it's perfect for three to seven players. Oh Hell is unique in that you'll deal a certain number of cards for each hand, progressively dealing out more cards as you play. It lets the first player call which suit is to be played and everyone has to follow suit if they can. There are also trump cards, so things do get interesting at times. Hearts is a very old game and it remains popular. Its predecessor was called reverse, and that one dates back to the 18th century. It's a single-player game, so it also works for three to seven players. Unlike other games, your goal with hearts is not to win tricks, but to lose certain tricks. You want to watch out for "Black Maria" (the queen of spades) in particular, as well as any cards in the heart suit. Scoring for this game is also reversed. You don't want to score points because the player with the lowest score wins. Hearts has many variations in gameplay. Cancellation hearts and omnibus hearts are two popular versions that you might want to play as well. Pitch is another great game and you might hear it called auction pitch or setback. It's a single-player game of three to seven players and you can adapt it to two teams of two players if you like. With this game, you'll play with a full deck and it includes trick bidding. The player with the highest bid becomes the pitcher (hence the game's name). The catch with pitch is that there are a lot of rules and scoring can be rather complicated. You might need to print out the rules so you can easily reference them. None the less, it is a fun game and definitely worth taking the time to learn. It's a good choice for a regular card night with the same group of players.